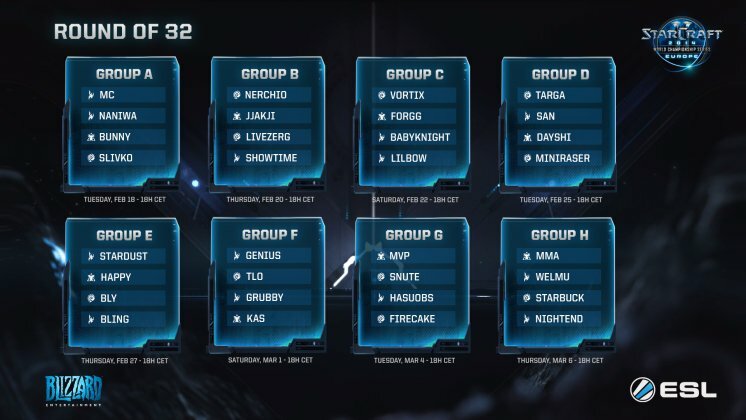 The Ro32 groups for WCS Europe's first Premier League have been revealed. WCS Europe Premier League will kick off on February 18th. You can find more information Liquipedia! I guess this thread wins. Snute vs. Hasuobs, Hasuobs vs. Firecake........ nope. Good thing Hasuobs started to all-in Zergs because he cant be bothered with SH. Also why is there a Terran in every group again? You cant tell me that this was a completely random draw. Group G is gonna end as Group H begins. San with a relatively easy group! If Nani beats Bunny, he will advance as first, MC as second, but either way only these two have nice shot to advance. Jjakji will advance from sure from group B, i guess Nerchio has biggest change to be second but if LZ advances - no big deal. Group C will be such fun, if BBK beats ForGG in first match...ah nah, ForGG and Vortix. Stardust is pretty safe choice in group E, especially because he has his favourite PvP first, Bly and Happy will coinflip, slight edge for Bly probably, dude is improving hugely and Happy pretty much failed at ASUS ROG. Group F is funny group. Let's say, if Grubby wins against TLO, Genius will advance as first and Grubby as second. If TLO wins, then Grubby can coinflip with Genius for 2nd spot, behind TLO's first. Group G AHHAAHAH. Firecake, Snute and Hasuobs in one day? I will probably sleep this day, sorry guys. Mvp is still safe choice, especially if Snute wins against Hasuobs, Snute will advance though as well. Hasuobs is using proxy gates, soul train, cannon rushes in nearly every game vs. Zerg nowadays. Even he cant be bothered with that style anymore. I hope Vortix wins this BIGTIME!! libera te tvtemet ex inferis A.'.A.'. i do not envy hasuobs, mvp or snute >.> every korean got a very easy group except stardust who has a tricky bly but still should make it over happy and bly. genius should be very careful TLO and grubby will prepare stuff! overall pretty amazing groups i have to admit, no real group of death.